With increasingly stringent regulatory requirements (including Basel III, mandatory clearing, segregation and BCBS-IOSCO) and generally higher capital costs, financial market participants are focusing on optimising the use of collateral to manage their risk exposures (against other participants and CCPs) and obtain liquidity for short-term funding purposes. ASX Collateral, ASX's Centralised Securities Depository (CSD) tri-party collateral management service, provides a flexible, scalable solution to efficiently collateralise exposures across a range of A$ products. 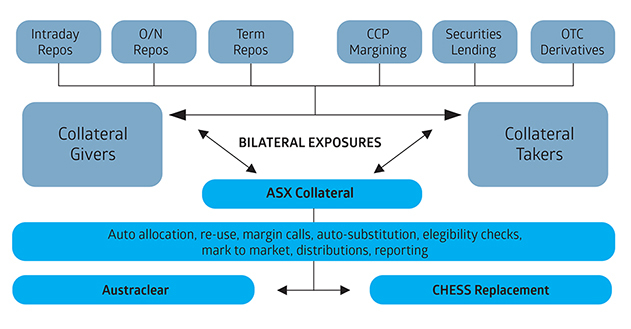 The ASX Collateral Bulletin provides an insight into the utilisation of the ASX tri-party agent, and updates on matters relating to collateral management. Click here to subscribe to this regular Bulletin. ASX Collateral leverages Clearstream Banking SA technology to facilitate the automatic allocation and optimisation of collateral across an array of bilateral agreements and counterparts. Assets are assigned as collateral based upon a set of elegibility criteria determined by the counterparts. The automated service uses proven asset optimisation algorithms and integrates directly with ASX's Austraclear securities settlement service (and CHESS replacement n a later phase) to ensure smooth transition of collateral between collateral givers and takers. ASX Collateral's secure ASXCOL+ web interface service can be run in a secure Virtual Private Network (VPN) environment or over the internet. Customers can use ASXCOL+ to instruct new exposures and monitor their existing exposures. Australia’s repo market continues to evolve. Tri-party repo requires less administration and high volume trading, making it an easier way to transact in the repo market. Find out more in the latest edition. In 2013, ASX announced a partnership with Clearstream and three other CSDs worldwide to form the Liquidity Alliance, an association of industry peers which aims to create a sustainable international industry approach to address the global collateral crunch. Liquidity Alliance A Sustainable Solution to Combat the Global Collateral Challenge. A paper published by the Reserve Bank of Australia (RBA) looked at the increasing demand for Australian Dollar denominated liquid assets as collateral, both for short term funding and to manage counterparty credit risk on derivatives transactions. The paper explores the likelihood of further demand for assets with low market and credit risk arising from regulatory changes.